Have you ever got dressed up and gone out with friends then, faced with the option of going on to a smoky nightclub to have fun or heading home at a sensible hour, you throw caution and the certainty that you will regret your decision in the morning to the wind, and choose to dance in bad air until the small hours of the morning? 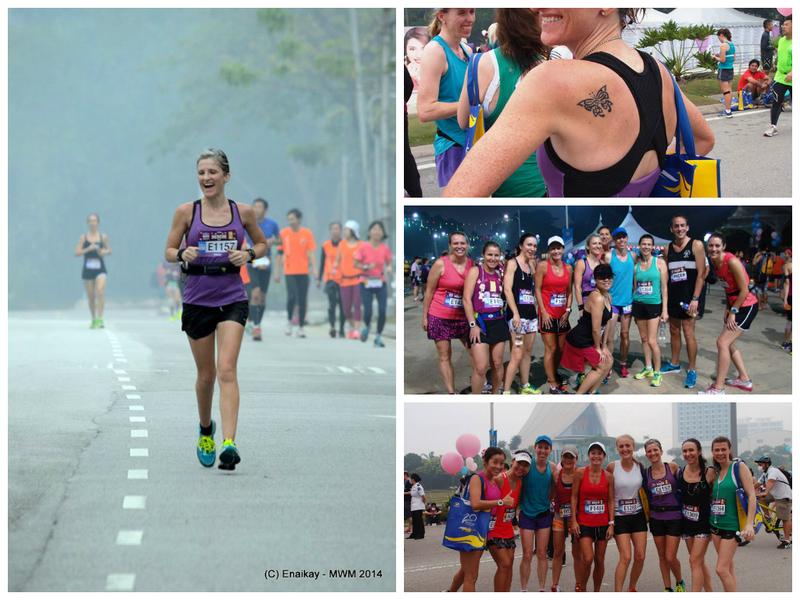 Well that’s what the decision to run the Malaysia Women Half Marathon (MWM) was like yesterday morning. Except I didn’t get a hangover. There I was, at 5 AM, having jogged to the start line, race kit on, bottle filled with electrolyte drinks, the acrid smell of smoke in my nostrils and throat, faced with the dilemma of heading home full of carbs and adrenaline or running in air that was so polluted that I would absolutely have forbidden my children to stand outside for a minute, not to mention run for the best part of two hours. Of course, I ran. I am happy to report that unlike many a night out in my now distant past, I remember the whole occasion very vividly, despite the dark, hazy conditions, and as a French person might say, je ne regrette rien. A little background for those not living in Kuala Lumpur. 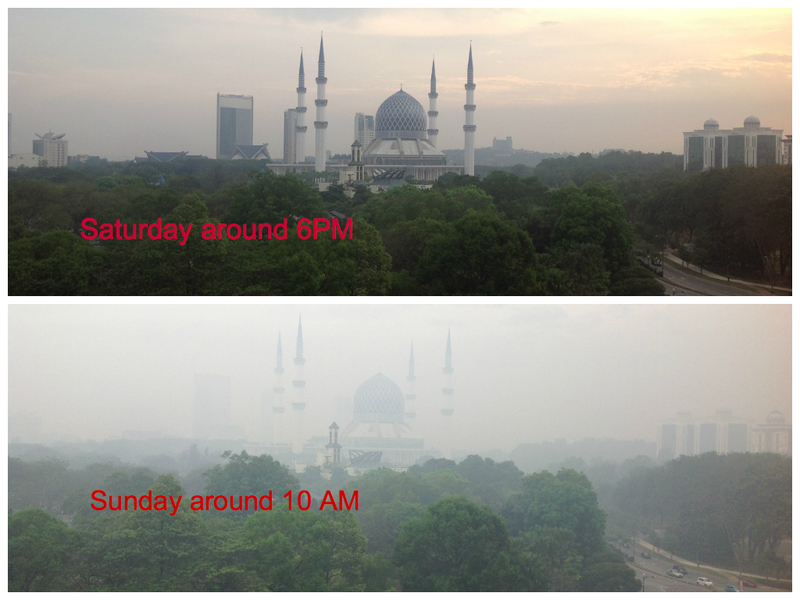 For the past week, the city and the wider environs of Klang Valley have been experiencing pollution due to burning. On Friday, in Shah Alam where MWM was to take place, and several other areas, air quality levels were well into the unhealthy range. Sporting activities throughout the city were cancelled/postponed and many schools were closed. MWM organisers were faced with a dilemma on whether to go ahead with the race on Sunday, not knowing whether the haze would clear by race day. It was announced that a decision on the race would be take on Saturday evening based on the published pollution levels. Runners were understandably agitated over whether to cancel their babysitters and put away their bowls of pasta. Just in case I didn’t get to run, I bought two running skirts in honour of the event. Then, Saturday morning, KL residents awoke to clear blue skies and a refreshing breeze. The news from Shah Alam was that it was clearing there too. The race would go ahead as planned. 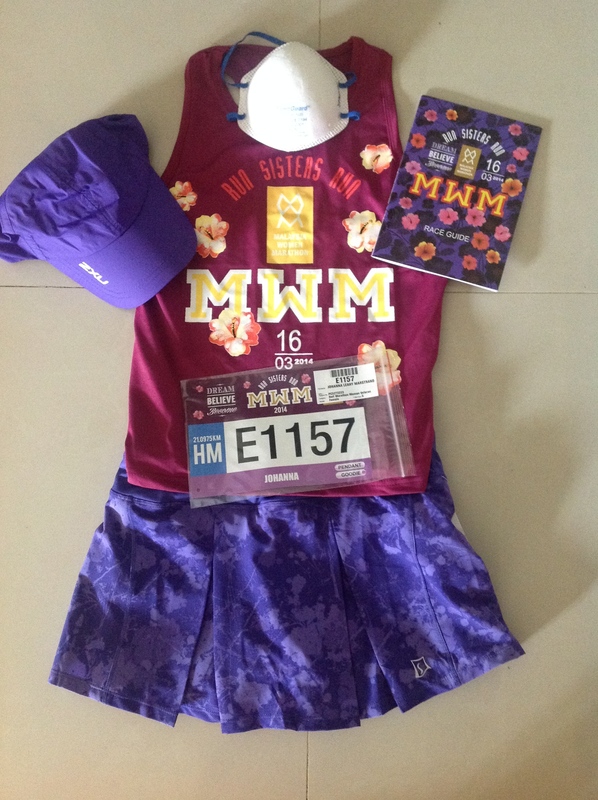 My first running skirt with my MWM kit. 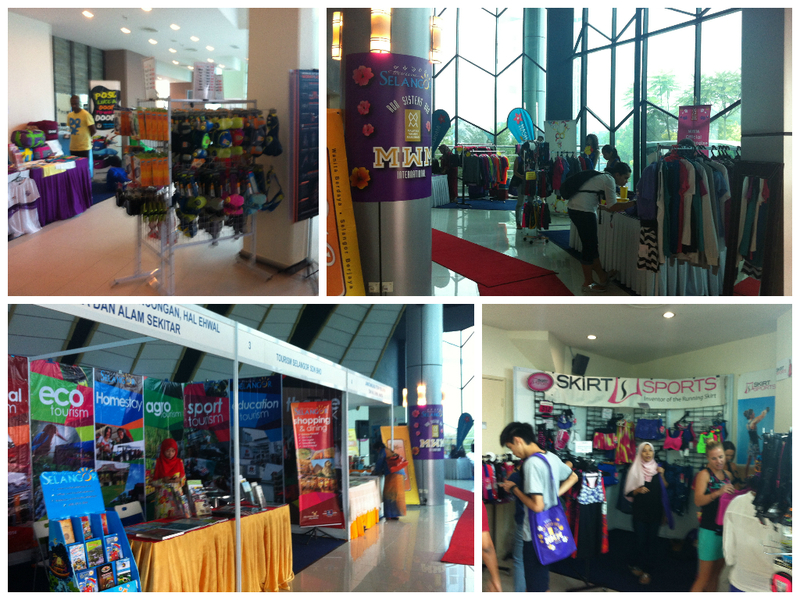 I bought the skirts from Skirt Sports who lugged their wears from Australia to sell at the MWM Race Kit Collection & Expo at Shah Alam Theatre which took place on Friday and Saturday. As well as offering a platform for vendors and running event promoters, the Expo provided inspirational talks, including one from MWM2014’s Guest of Honour, Catherine Ndereba. Catherine’s marathon achievements have earned her the moniker, the Marathon Queen, and she has been described as the greatest women’s marathoner of all time. In short, this lady is a legendary athlete. Unfortunately, I didn’t make it to Shah Alam in time to catch Catherine’s Friday presentation on balancing motherhood and a career. But by the power of serendipity, I did get to, not only meet her, but speak to her (and watch her eat pasta). Having decided to stay in a hotel in Shah Alam on Saturday night to avoid pre-race stress and travel, my friends and I went to the hotel restaurant for dinner to find Catherine sitting with two runners I know, Elvin and Wai-Yee. Catherine was so gracious not only to pose for a photo but to spend time talking to us. Having done a whirlwind of press, meet-and-greets, and goodness knows how many photo opportunities in the previous three days, combined with jet lag after her trip from Kenya, I’m sure Catherine was exhausted. Yet she was friendly, generous with her time, and recommended ice baths and massage for post-race recovery. The next time we saw her was at 5 AM Sunday morning, returning from the race start venue, having flagged off the Full Marathon, in a break before running a 5km later with Race Director Karen Loh. I haven’t mentioned Karen up to now, but MWM now in its second year, is her vision and how she has implemented it here in Malaysia, deserves a post of its own. Today I will stick with the event itself. As my friends and I drove out to check into our hotel around 5PM on Saturday, we could see a wall of haze ahead. Had it not retreated after all we wondered, or was this a case of the haze returning? Unfortunataly, despite some rain on Saturday night, it was the latter. The haze returned with a vengeance over night. Early Sunday morning, with so many runners at the start line already, the organisers decided that the runs would no longer be competitive, that the prize money would go to charity, and if runners wanted to run for fun they were free to choose to do so. A large group of us who know each other, were assembled near the start line, prevaricating over what to do. I wasn’t going to run. I couldn’t defend it to my family if it made me sick, I said. I spent so long standing around saying that I didn’t think I should run, that I forgot to go to the loo and I didn’t stretch. Well, I wasn’t running so why would I do either! Then, I realised that the people I was with were going to do an easy run that wouldn’t tax the lungs, and as I had to wait around anyway, I decided to run with them. We started slowly, at 5:45 AM, no rush, chatting away as if it was our usual weekend LSD. The relief of not having to race was palpable. It was great! I stopped at a portaloo at 8km and my unstretched leg muscles loosened up around that time too. I managed to catch up with my friends again after my pitstop and stayed with two of them the rest of the way. I wasn’t focussing on my pace, just on keeping moving forward. Even without the pressure to achieve a PR, I still didn’t find running a half marathon easy but it wasn’t unpleasant either. Having company made all the difference, as did having a friend, a very accomplished runner, offer encouragement and pacing all the way. My legs felt heavy from about 13km onwards but my lungs felt fine, and the desire to stay with my buddies kept me going even when my brain was starting to regret having set off at all. To their credit, despite the haze, volunteers stayed to man the water stations which were well stocked, regularly spaced out at 2km intervals, and each with a portaloo. Others cheered us on. Inspirational signs appeared along the route. I think one said: ‘I have mascara that runs faster than that’ which was less of an inspiration, more of a rebuke. Or was I hallucinating in the haze? I loved the route, in that the roads were wide and the hills were manageable. My only criticism was that the street lights were out for long stretches which made me glad that I was running with a group as it was pitch dark. There were plenty of traffic cops on duty and many more volunteers offering directions, though a few more directional signs at junctions would have been nice. There were plenty of distance markers. The fire truck spraying its hose over the road was a fantastic surprise and very well received, as were the volunteers with their water spray bottles. I get emotional when I think of the people who get up to support and take photos of runners in the middle of the night. You guys and gals are nothing short of amazing and really made this race (or non-race) experience something special. The route turned out to be more than 500m too long and as I upped my pace at the end, Strava calculated a PR of 1:50 for 21.1.km, by lopping off the first half kilometre which was very slow as we were just jogging and talking. As the many photos cropping up on Facebook are showing, despite the conditions, and the disappointments of the Marathon runners who had their runs cut short, MWM brought together a diverse community of runners with spirit and enthusiasm, all aspiring to Karen Loh’s suggestion to ‘Dream, Believe, Become.’ The weather did nothing to dampen the enthusiasm of the volunteers who did magnificent jobs in what I think was a very well-organised event. 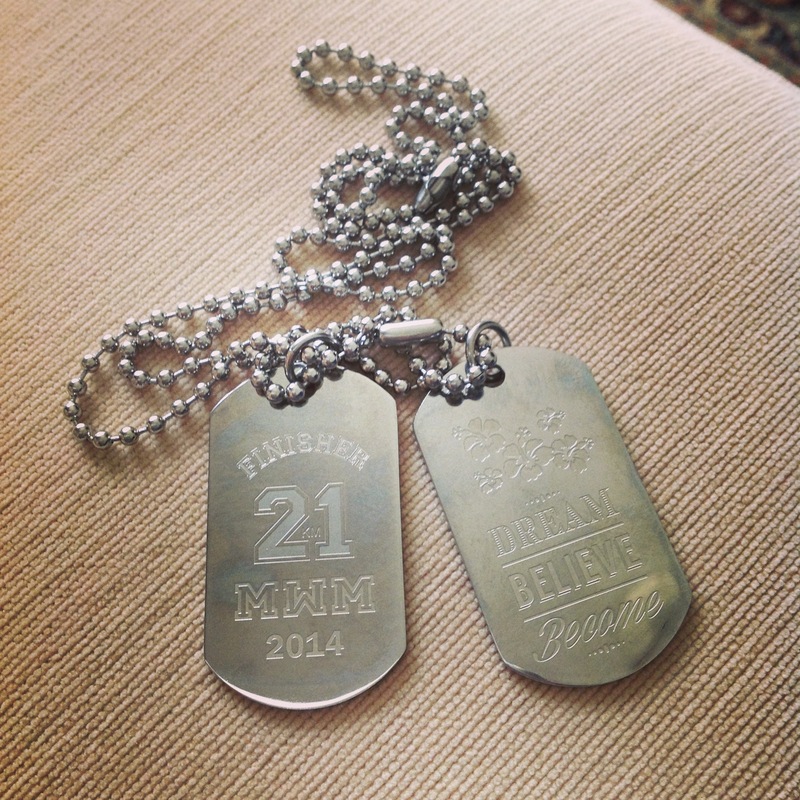 So finally a Half Marathon during which I did not feel nauseous, did not get a stitch, nor did I stop to walk. Finally, after three miserable experiences, it seems I’ve figured out my fuelling strategy. Yay! For me, running with friends, not competing with them (or even against myself), made MWM an even more positive experience than I could have imagined. The camaraderie of yesterday morning is what running is all about and I would not have missed that for the world. That said, I respect the decision of the people who chose not to run, which was the sensible thing to do. Believe me, I’ve gone home to bed early many, many nights while friends have partied on. For once, I took a risk, and I don’t regret it. Ultimately, we each had the freedom to make a choice, which after all is what empowerment is about. As well as great memories of MWM2014, I’ll always have these photos of my meeting with a running legend. I’ve no idea what I was saying, it was probably something like, ‘You are amazing. How do you do it? !’ but of course my friends and I have had a lot of fun adding funny captions of me offering Catherine Ndereba advice on everything from cable-laying to achieving a PR. Catherine told us that she doesn’t know how to stop running, as she loves it so much. I know how she feels, though obviously on a far less legendary (and slower-paced) level. Run, sisters, run! Photos on this post courtesy of: Nik Fahusnaza, Elvin Tan Chye Guan, Wai-Yee Chan & The Expat Runner. ET Tey – provides lots and lots of photos, and a comprehensive list of links to photographers who attended the event.